Manju Kapur's fifth novel – following her highly acclaimed works such as Difficult Daughters (1998) and The Immigrant (2009) – explores the tumultous relationships once again set in the thriving, upper-middle-class colonies of Delhi in the mid-90s. The story thrives against the backdrop of the initial surge of foreign investment in India. The very first chapter of the book begins to enthrall a reader with the couple's love making scene. The only glitch is this: it is a married woman having a romantic adventure with her husband's boss. Cheesy as it may seem, the book sets itself apart by diving straight into the troubled waters yet without taking any sides, revealing once again the mark of a true family writer. Shagun, the green-eyed beautiful wife of Raman, falls in love with his charismatic, handsome boss Ashok Khanna, who has never been in love before and is determined to possess the woman he now loves. It does not matter to him how but he goes about conquering Shagun's mind, body and soul like a seasoned, persuasive marketer. He represents everything that a woman of today would find difficult to resist. The pace of the story gains momentum as their affair begins to become more fiery, daring and passionate. Shagun has no regrets about lying to her husband or to her own mother. The extent of her selfishness and ability to be cruel is visible in the choices she makes. For example, she leaves her kids with her mother to go off for weekend trysts with her new found lover. Yet she convinces herself all the time that she is a devoted mother to her children. In fact, she goes to all lengths to brainwash her children against their own father, knowing that this would be of use to her to negotiate her terms of divorce when it is finally time. Although the book never tips into preaching morals, it’s precisely at such critical, emotion-packed moments that the story skirts closest to the society's traditional norms and conventions. Manju Kapur demonstrates her intrinsic level of detailing with tiny social observations such as how Shagun's mother does her best to coax her to remain faithful to her husband and in retaliation, Shagun threatens to completely stop confiding in her mother if this is how she is going to take sides. Meanwhile, Raman, who is a sincere, hard working man and a thoroughly devoted husband, struggles to understand what is going wrong in his relationship with Shagun. He adores her but he is puzzled when nothing he says or does seems to please his beautiful wife. But finally when he discovers the truth, the devastation he experiences is just a tip of a massive legal iceberg. Their lives are catapulted and crushed by the ever slow, grinding wheels of the rigid legal system in India. This is when the quiet, reliable cousin Nandan steps in to help Raman who is totally clueless about how the legal system works in India. Worst of all, he begins to realize that marriage to Shagun whom he had loved blindly had been a big mistake, one for which his children too would pay a heavy price. Who will get custody of the kids - that becomes the question for Raman and Shagun? Their legal battle turns inevitably ugly. While the parents are embroiled in a legal battle for custody of the children, they do everything they can to make the children feel worse. Their son is a replica of Shagun - selfish, cruel and indifferent to anything but his own satisfaction and their daughter is a miniature of Raman, who is very loving, understanding and generous. The children find their own ways to tackle the crisis because they are confused and feel divided loyalties swarm around them, throwing them into tough, emotionally disturbing situations with their parents. And for any child, having to choose between parents is the toughest and most emotionally devastating thing to contend with. As a parallel story, the plot swerves to capture the troubles of Ishita, who is the daughter of Raman's mother's dear friend and neighbor. Reflecting the dismal marriage scenario that prevails in most middle class Indian families, Ishita's problems begin when she is unable to conceive. Her mother-in-law and sisters-in-law who doted on her and acted as though they were all dear friends changed overnight when they realize that Ishita is medically pronounced as unable to have children. Without being judgmental or preachy, Manju Kapur conveys the typical middle class mentality of Indian families, particularly in tackling situations like this. The well-knit story reveals the layers of dirt that are hidden behind the 'happy family' syndrome among middle class families. An example: Ishita's mother-in-law holds detailed discussions with the doctor to dig deep into understanding the medical cause of this condition. Everyone's curiosity is satiated when the doctor clarifies that it is Ishita's fault and that this happened because she had contracted an illness in childhood that had damaged her system. In Ishita's story, there is nothing shocking but what is clearly absent is her in laws lack of sympathy or understanding to the girl who could have been seen as their daughter instead of their daughter-in-law. And thus, Ishita's husband who had proclaimed never ending love to her becomes the obedient son to his parents. The coldness, the cruel indifference and finally the rejection of a wife solely because she cannot bear a child is portrayed in a heart rending way. Perhaps the author conveys with these instances that even domestic pets are treated better than a daughter in law in some Indian families. A divorced, socially isolated Ishita finds the courage to volunteer and teach underprivileged children. She loves children and they love her back. Gradually, she finds hope and in the process, her own lost sense of individuality. But her parents, particularly her mother, is actively back in a match making mode. That is when her mother and Raman's mother decide to do everything they can to bring their divorced offspring to notice each other as suitable prospects for marriage. The novel’s portrayal of Ishita is refreshingly free of the cliches that are associated with the 'wicked stepmother' syndrome. Despite Manju Kapur's careful neutral tone, what stands out as stark reality is the loneliness and sheer emptiness that Raman, Shagun and Ishita undergo. Do they represent an emerging group of young, successful, educated Indians who can choose the direction of their destiny so easily no matter what the underlying moral implications are like? Or is it reaching a point where expecting morality and fidelity in a marriage is like chasing an illusion? 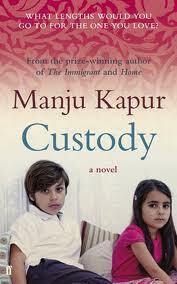 Manju Kapur's 'Custody' demands a sensitive reading and it offers readers with many important aspects of understanding how marital life in India is fast disintegrating and being shaped by extra marital affairs, materialistic pursuits, and so on. It also offers valuable insights into the vulnerability of children of broken marriages and new 'happily divorced and remarried' statuses of Indian couples. This is not merely a story. It is a battlefield of sorts that tears your heart and soul apart because of it's masterful narrative and honesty. Read it but be ready to cry. .. NGDCs .. slightly spicy read .. I may not happen read that book but the review made me think of probable solutions for such issues in a more rational manner .. Here the tussle seem to be whether marriage needs to be given any sanctity or not .. Sanctity and Discipline in Married Life seems to be more beneficial to children .. Maybe a More Rational Thought might suggest, till the children are married or settled, the soceity can not be blamed in putting up some restrictions with many hindrences upon extra marital affairs .. maybe for a better Civic Sense with Existence .. This story is indeed a mirror of what many families face not only in India but in the round world itself.